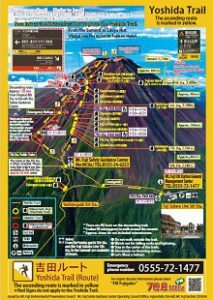 In 2019, the Yoshida Trail may be closed from above 3,450 meters until July 9, 2019. Click here for details. 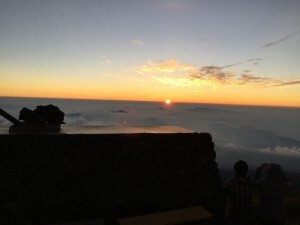 There is no cancellation fee if you cancel a reservation that was made for one of the days that the trail to the top of the mountain will be closed on. Customers can make online reservations for the year 2019 from 12:00 a.m. on the morning of April 2nd, 2019 and phone reservations from 10:00 a.m. on the morning of April 2nd, 2019. For online reservations, please click “◯” or the number of the day you would like to reserve. Online reservations are available midnight up to 2 days in advance. Online reservations for private rooms are only available for 2 people. If you reserve a private room for 3 people, 3 people will be staying in one room. Immediately after an online reservation is completed, please make sure to take a note of the reservation ID and the registered mail address which are displayed on the screen. A reservation completion e-mail will be sent, please make sure that the e-mail will not be sent to a spam or junk mail box. If you don’t receive the e-mail, please change your e-mail address on the reservation confirmation page or please call +81-555-73-8704. For those who have made an online reservation, please show the details of the reservation e-mail to our staff when you check in. Last check-in is at 8:00 p.m..
Plans for Saturdays, one day before a national holiday and plus for private rooms come with 2 meals. 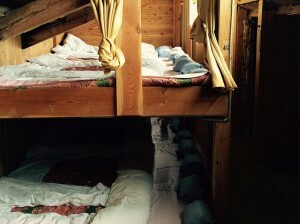 Sleeping areas (except private rooms) are shared. We will assign your room upon your arrival, therefore, you can not choose your room. For private rooms, you can choose your room when you check in. Each room rate is charged per person, per night, including tax. Payment has to be made by cash on site, or it can be made in advance by credit card(only for those who reserve online). Those who made online reservations can make a credit card payment for the accommodation fee 2 to 10 days before the date of the reservation. A discount of 300 yen per person will be given to those who make their credit card payment before the date of their reservation. Preschool children do not receive this discounted. *If the holiday lasts for 2 days, the first day is considered a pre-holiday. There are no private rooms at the Original 8th Stn. Tomoekan. For children under school age, the accommodation fee is half price of the adult rate (No meal). Adult accommodation fee apply to anybody who is older than school age. 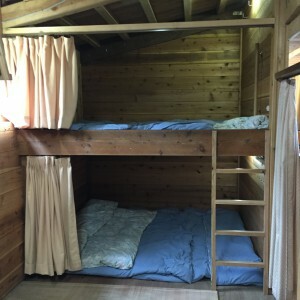 The accommodation fee for children under school age for Saturdays or pre-holidays is 3,650yen per child. Meals are not included, therefore, please order from the menu. If cancellation is the guests’ fault, the following cancellation fee will be charged. A cancellation fee will not be charged for changing the reservation date or changing the number of people, in cases, for example, when the road is closed due to a typhoon. You can confirm your reservation, change the number of people or cancel the reservation from the website link below. The reservation ID listed in the reservation completion e-mail and the registered e-mail address are required. If you would like to change the reservation date, you need to cancel your reservation and do it over. Change / cancellation of the reservation has to be made by 12:00 a.m. 2 days before the actual day of the reservation. It is not possible to increase the number of guests for a reservation when rooms are fully reserved. You can make the payment with your credit card from the reservation confirmation page. For online reservations, the accommodation fee can be paid by credit card 2 to 10 days before the reservation date. Tomoekan will pay the service charge from the credit card company. You can not change the number of people and meals after the settlement fee is payed. A discount of 300 yen per person will be given to those who make their credit card payment before the date of their reservation. Preschool children do not receive this discounted. Settlement information is exchanged using SSL encryption. The online settlement on our website is a provisional settlement (dependent on the securing of credit limit), we will process your final payment after your stay. Please open the reservation confirmation page by entering the reservation ID and the registered e-mail address. The “Pay” button will be displayed at the bottom of the confirmation page only 2 to 10 days before the reservation date, therefore, please click the “Pay” button if you wish to complete the credit card settlement. After the “pay” button is clicked, the total accommodation fee will be displayed. If there is no mistake, please click the “注文画面へ進む” button. Credit card settlement is the only payment method available online. You can use the following six cards. Please enter the 16 digit-credit card number(“クレジットカード番号”), expiration date(“有効期限”), and security code (CVC / CVV). * For security codes (CVC / CVV), if you have a VISA / Master Card / JCB / Diners Club / Discover card, the “Security Code” is the 3 digit number above or beside the signature field on the back of the card. If you have American Express, the “Security code” is the 4 digit number on the upper right of the card number on the front of the card. If there is no mistake, please click the “次へ” button. To confirm the final charge and confirm the settlement, please click the “注文を確定する” button. A settlement completion e-mail will be sent. Please be sure to present the contents of this e-mail at the reception desk upon your arrival. Please be aware that there have been many cases where settlement completion e-mails have been received into e-mail spam folders. If you do not receive a settlement completion e-mail, please call +81-555-73-8704. The online settlement on our website is a provisional settlement (dependent on the securing of credit limit), we will process your final payment after your stay. Even after your settlement is complete, you can still confirm and cancel your reservation on the reservation confirmation / cancellation page. After your settlement is complete, you can not change the number of people or meals. Changing the date will result in the need to make a new reservation after canceling your original reservation. No cancellation fee will be charged for changing dates. We do not process the final credit card settlement for canceled reservations, therefore, the payment will not be withdrawn. We will prepare a hot meal for your tired body. 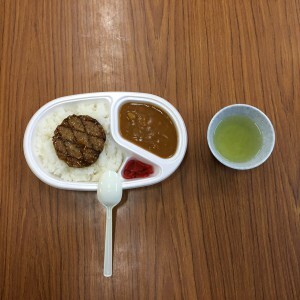 We serve curry with a ground beef patty for dinner for adults. We can prepare non spicy curry for children, therefore, please make any requests at the reception desk. Vegetarian curry is available. If you would like this option, please tell us at the reception desk. 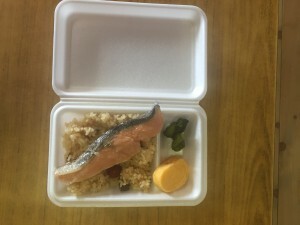 Breakfast is a mixed rice lunch box with a piece of salmon, an egg omlet and pickles. 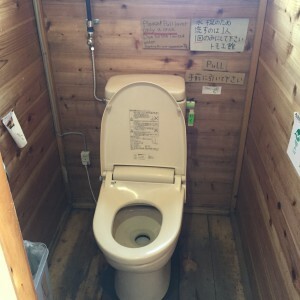 It is an environmentally friendly flush toilet with heating toilet seat. For the maintenance, we would like to ask you for 200 yen for donation. There is no place for charging your electrical devices on Mt. 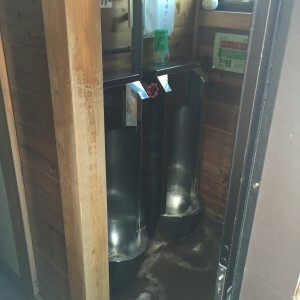 Fuji, only for guests staying at Tomoekan, you can use the power outlet for free. Please put clothes in a plastic bag in order to protect them so that they stay dry even if the inside of the backpack gets wet. 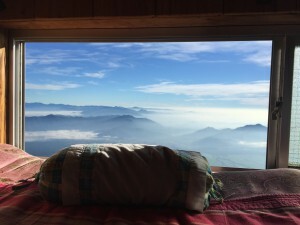 Because the altitude at the mountain huts is quite high and the temperature is low, the bedding will not dry if it gets wet, therefore, you can not use the bedding if you are wet. Also, if you are wearing wet clothes you might get hypothermia or catch a cold, therefore, please change into dry clothes. Be sure to bring dry clothes (tops and bottoms). Guests can not choose the sleeping area. On weekends it is particularly crowded and the sleeping area may become narrow enough to hit the shoulder of the next person. If you want to stay for enough space, we recommend avoiding crowded weekends and staying at the 7th Stn. Tomoekan. The Original 8th Stn. 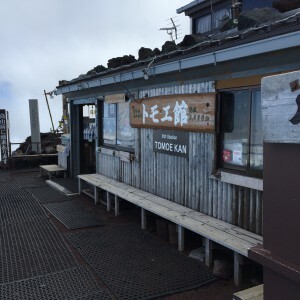 Tomoekan is located at an altitude of 3,400 m. It takes about 1 hour 30 minutes to reach the summit. The Original 8th Stn. 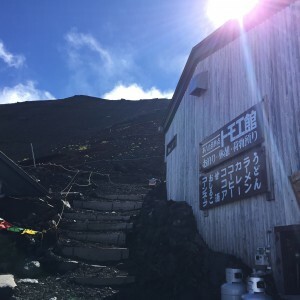 Tomoekan is located at the crossing point of the Yoshidaguchi trail and the Subashiriguchi trail, as well as being the starting and ending point climbing to the summit, therefore, you can leave your luggage and climb back and forth between the summit and our hut. The night view of the Kanto region, the view of the shadow of Mt. 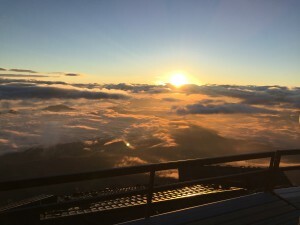 Fuji at dusk, and the view of the sea of clouds from the Original 8th Stn. Tomoekan are superb. It will take about 5-6 hours from the Subaru line 5th Stn. to reach the Original 8th Stn. Tomoekan, therefore, please leave the Subaru line 5th Stn. in the morning. 10:00a.m.-10:30a.m. After arriving at the Subaru Line 5th Stn. take a break After arriving at the Subaru Line 5th Stn, please rest for at least 30 minutes for adapting the high altitude. 10:30a.m.-12:30p.m Climbing to the 7th Stn. Tomoekan Departing to the 7th Stn. Tomoekan from the Subaru Line 5th Stn..
12:30p.m.-1:30p.m. Taking a break at the 7th Stn. Tomoekan Those who do not eat lunch, please eat lunch at the 7th Stn. 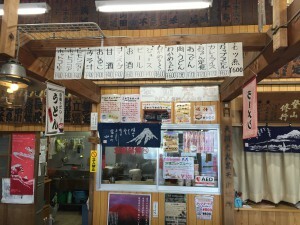 Tomoekan, there are plenty of meal choices. 1:30p.m.-4:30p.m. Climbing to the Original 8th Stn. Tomoekan Departing to the Original 8th Stn. Tomoekan from the 7th Stn. Tomoekan. 4:30p.m.-2:00a.m. Dinner and a rest at the Original 8th Stn. Tomoekan Eating dinner at the Original 8th Stn. Tomoekan, and staying there to rest well. 2:30a.m.-4:00a.m. Climbing to the summit It will take about 1 hour 30 minutes to the summit. 4:00a.m.-5:00a.m. Arrival at the summit When you arrive at the summit, take a break and move to the place where you can see the sunrise. 5:00a.m.-6:30a.m. Cruising the bowl It takes about 1 hour 30 minutes to go around the bowl. 6:30a.m.-7:00a.m. Returning to the Original 8th Stn. Tomoekan Descending to the Original 8th Stn. Tomoekan on climbing down trail. 7:00a.m.-8:00a.m. Breakfast at the Original 8th Stn. Tomoekan, Preparing to descend Eating packed breakfast at the Original 8th Stn. Tomoekan and preparing to descend. 8:00a.m.-11:00a.m. Descending to the Subaru line 5th Stn. Descending to the Subaru Line 5th Stn. from the Original 8th Stn. 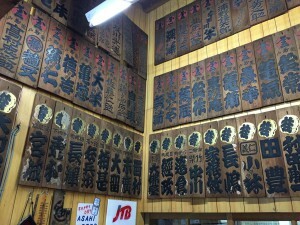 Tomoekan. The 7th Stn. 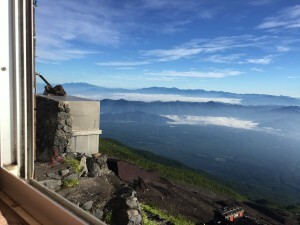 Tomoekan is located at altitude of 2,740 m, is the Mt. 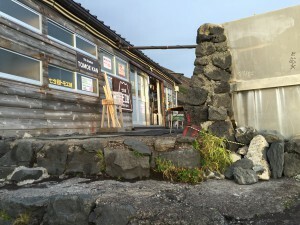 Fuji hut that built private rooms for the first time. The 7th Stn. Tomoekan take about 2 hours from the Subaru line 5th Stn. It is recommended for children and elderly people to stay. There are private rooms in the 7th Stn. Tomoekan. They are divided by curtains and therefore, you can have the space for you own. A private room is equipped with an electric lamp, hangers, a mirror and a power outlet. 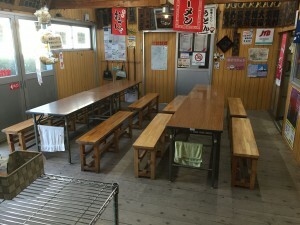 Reservations can be made from 1 room for 2 people (if there are preschool children, 1 room for 3 people). 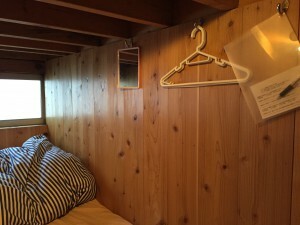 You can upgrade your room to the private room by paying extra 1,000 yen. Plans for private rooms come with 2 meals. 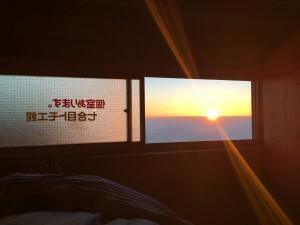 The Yoshidaguchi trail is facing the east side, and you can see the sunrise from some private rooms with the window. You can not make reservations for specific private rooms, but you can choose your room when you check in. There are hangers, a mirror and a power outlet in our private rooms. There is a light for the private room, therefore, turning it on / off will be up to you. 2:00p.m.-2:30p.m. After arriving at the Subaru Line 5th Stn. take a break After arriving at the Subaru Line 5th Stn, please rest for at least 30 minutes for adapting the high altitude. 2:30p.m.-4:30p.m. Climbing to the 7th Stn. Tomoekan Departing to the 7th Stn. Tomoekan from the Subaru Line 5th Stn..
5:00p.m.-3:00a.m. Dinner and a rest at the 7th Stn. Tomoekan Eating dinner at the 7th Stn. Tomoekan, and staying there to rest well. 3:00a.m.-7:30a.m. Seeing the sunrise You will see the sunrise during climbing trail. 7:30a.m.-8:00a.m. Taking a break at the Original 8th Stn. Tomoekan You can deposit your backpack at the Original 8th Stn. Tomoekan. 8:00a.m.-9:30a.m. Climbing to the summit It will take about 1 hour 30 minutes to the summit. 9:30a.m.-10:00a.m. Arrival at the summit When you arrive at the summit, take a break and move to the place where you can see the sunrise. 10:00a.m.-11:30a.m. Cruising a bowl It takes about 1 hour 30 minutes to go around the bowl. 11:30a.m.-12:00p.m. Returning to the Original 8th Stn. Tomoekan Descending to the Original 8th Stn. Tomoekan on climbing down trail. 12:00p.m.-1:00p.m. Lunch at the Original 8th Stn. Tomoekan, Preparing to descend Eating lunch at the Original 8th Stn. Tomoekan and preparing to descend. 1:00p.m.-4:00p.m. Descending to the Subaru line 5th Stn. Descending to the Subaru Line 5th Stn. from the Original 8th Stn. Tomoekan. Shinjuku Expressway Bus Terminal / Yokohama Sta. Hiyoshi Sta. / Center Kita sta. / Tama Plaza / Ichigao Sta. Q: How long does it take from the Subaru line 5th Stn. to the Tomoekan? A: The Subaru line 5th Stn. → About 5 – 6 hours to the Original 8th Stn. Tomoekan. The Subaru line 5th Stn. → About 3 hours to the 7th Stn. Tomoekan. The 7th Stn. Tomoekan → About 3 hours to the Original 8th Stn. Tomoekan. If you reserve a room at the Original 8th Stn. Tomoekan and departing from the Subaru line 5th Stn., please depart from the Subaru line 5th Stn. in the morning. 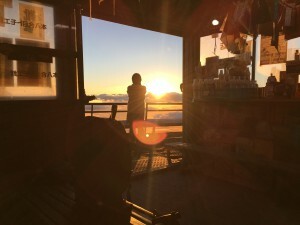 Q: How long does it take from the Tomoekan to the summit? A: The Original 8th Stn. Tomoekan → About 1 hour 30 minutes to the summit. The 7th Stn. 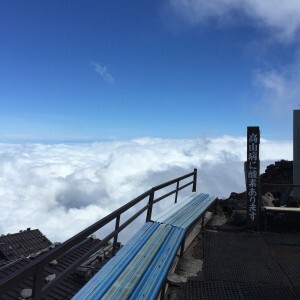 Tomoekan → About 4 hours 30 minutes to the summit. Q: What time is sunrise. A: Early July / about 4:30 a.m.
Late July / about 4:40 a.m. Early August / about 4:50 a.m.
Late August / about 5:00 a.m. 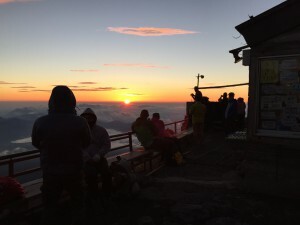 Early September / about 5:10 a.m.
Q: How long does it take from the summit to the Original 8th Stn. Tomoekan? A: It takes about 30 minutes to come down. Q: How long does it take from Tomoekan to the Subaru line 5th Stn.? A: The Original 8th Stn. Tomoekan → About 3 hours to the Subaru line 5th Stn.. The 7th Stn. Tomoekan → About 1 hour 30 minutes to the Subaru line 5th Stn. Q: Where can I pay the accommodation fee? A: You can pay by cash onsite or choose the advance credit card settlement (for online reservation only). Advance credit card settlement can be paid 2 to 10 days before the reserved date. You will get of a discount of 300 yen per person who made a credit card payment beforehand. Preschool children will not be discounted. 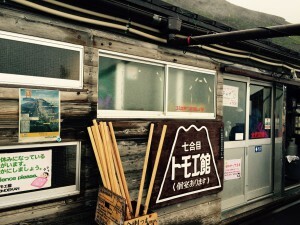 Credit card can not be used the mountain hut. Q: Can I use credit cards for any payment onsite? A: If cancellation is the guests’ fault, the following cancellation fee will be charged. A: There is online reservation available. Be sure to check the availability before making your reservation. Online reservations are available midnight up to 2 days in advance. Q: Can I confirm or change my reservation? A: When you make an online reservation, you can confirm, change, or cancel the reservation on the “Reservation Confirmation / Number Change / Cancel” page. Change / cancellation of the reservation has to be made by 12:00 a.m. 2 days before the actual day of the reservation. Also if you would like to change the reservation date, you need to cancel your reservation and do it over. It is not possible to increase the number of guests for a reservation when rooms are fully reserved. Q: Can I specify the spot to sleep in the room? 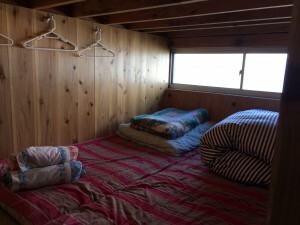 A: Sleeping areas (except private rooms) are shared. We will assign your room upon your arrival, therefore, you can not choose your room. For private rooms, you can choose your room when you check in. Q: What time is the check-in? A: Please check in 30 minutes before dinner time (described in the question answer below). Final check-in has to be made by 8:00 p.m..
Q: What time is the check-out? A: Please check out by 8:00 a.m..
Q: What time does dinner start? A: Dinner at the Original 8th Stn. Tomoekan starts from about 5:00 p.m. in order of arrival. Dinner the 7th Stn. Tomoekan starts from about 4:30 p.m. in order of arrival. A: We have packed breakfast for you. You can have breakfast at the Original 8th Stn. Tomoekan. The 7th Stn. Tomoekan gives you out a packed breakfast at dinner time. Q: Where can I brush teeth? A: There is no bathroom, therefore, please brush your teeth in the vicinity of the toilet. Mouthwash should be with the water you brought. Q: Is there a charge for using the toilet? 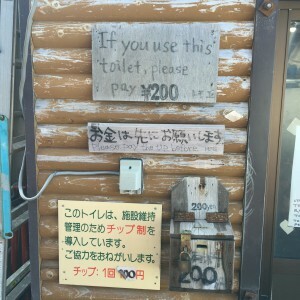 A: There is a tip system of 200 yen per use for maintenance costs. Q: Is there clothes drying? A: There is not. If you are wet from rain, you can not use the bedding. Please change into dry clothes. Be sure to bring dry clothes (tops and bottoms). 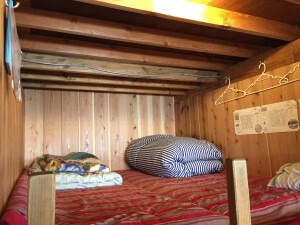 Because the altitude at the mountain huts is quite high and the temperature is low, the bedding will not dry if it gets wet. Q: Is there have a shower or bath? A: There is not. Mt. Fuji does not have a water supply, we use rain water from a reservoir tank. Q: What is the temperature? 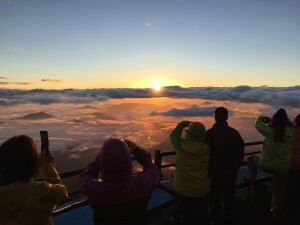 A: The average temperature of the summit is “4.9 ℃” in July, “6.2 ℃” in August, “3.2 ℃ in September”. From July to September, there are times when it will be below freezing in the middle of the night, therefore, please take measures against the cold. Q: Do you have free Wi-Fi service? A: Yes. For usage, please contact our staff. Q: Is there a device charger? A: There is not. 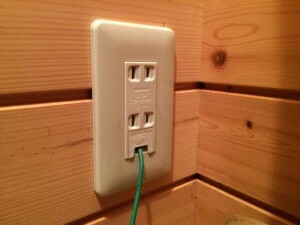 Guests are free to use power outlets, therefore, please bring your own charger. Q: Can self brought food and drinks be consumed in the hut? A: Water can be drunk anywhere. Other than snack foods, eating on the beds is banned. Please eat meals in the hall. A: We do. Due to barometric pressure, alcohol is absorbed quickly, therefore, there is a danger of acute alcohol poisoning, therefore, it is recommended to consume half your normal amount. Q: Can I use a cooking / gas burner? A: You can not cook inside or outside the building. The use of gas burners is prohibited.